GENTLE EXFOLIANT FOR DELICATE & DRY SKIN: This exfoliator blends mineral pearls that gently sweep away dull, dry surface skin, with Rose Stem Cells & antioxidant pomegranate to nourish & refine the skin's deeper layers for a flawless looking complexion. 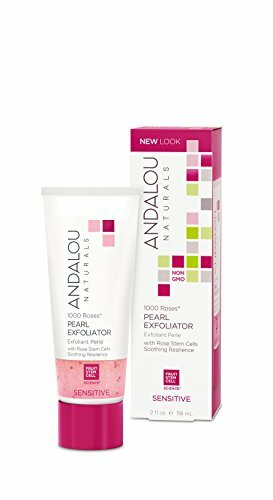 SENSITIVE & SOOTHING Andalou Naturals' 1000 Roses skincare collection uses rose stem cells formulated for delicate, dry, sensitive and easily irritated skin. 1000 Roses line includes a foaming cleanser, day and night cream, toner, lotions & facial masks. FRUIT STEM CELL SCIENCE: Andalou Naturals uses fruit stem cell technology to capture nature's intelligence in every product. Nature derived, sustainably sourced, Non-GMO and always cruelty free; at Andalou Naturals, beauty is natural because beauty is you.